I recently retired my old BlackBerry Pearl and moved on to a 8310 Curve. 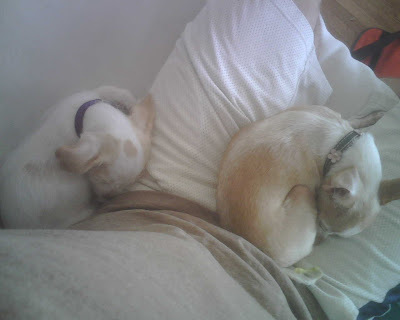 Before tossing the phone into the nether regions, I made a point to grab all the photos off the device. I've been shooting crappy low res digital photos for years. Give me a 1.3 megapixel and let me go to work! That's just my style. It was nice going through these photos. I got that phone a week after I moved to San Francisco, so in a lot of ways looking back through those pics was a bit of a stroll down memory lane. Some good, some bad, none I would trade for anything. At any rate, I wanted to post a few of my favs. 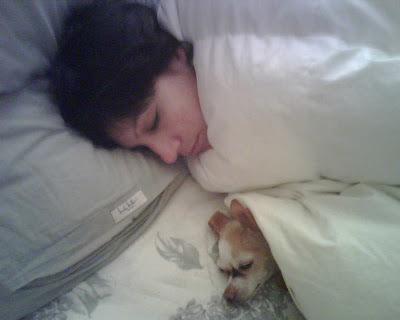 Not a lot of exciting stuff here, but some pics that despite their low quality hold some special meaning for me. Enjoy. 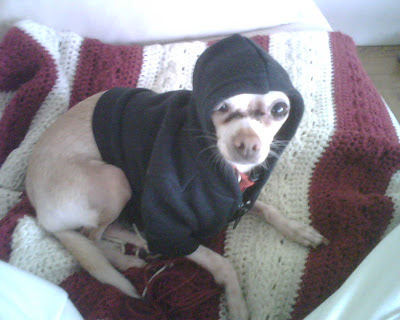 Clearly Lil Girl is 5 pounds of pure gangster. This shot always cracked me up, and looking back on it I'm reminded of the eye problem Lil Girl used to have. All that filthy discharge around her eyes is gone now, thanks to a healthy Jeffrey's diet. About 3 months after I moved, I got a call from my good friend Jesse on a random Tuesday night. He was in town. He had driven up with some friends of him and we ended up hitting quite a few spots around the city. In one of the more cutty locales, I snapped this shot of Jesse having a smoke. I've always loved it, and it sums up that night in so many ways. 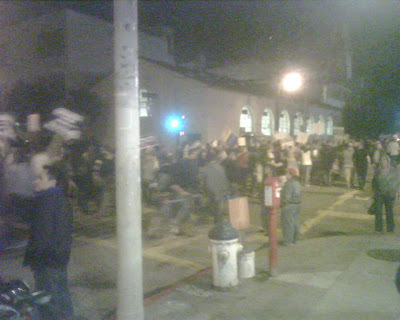 Election night 2008 was huge here in San Francisco, and in many ways bittersweet. 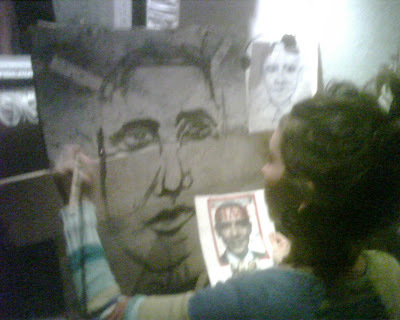 People took to the streets in celebration of Obama's ascendancy to the Presidency. 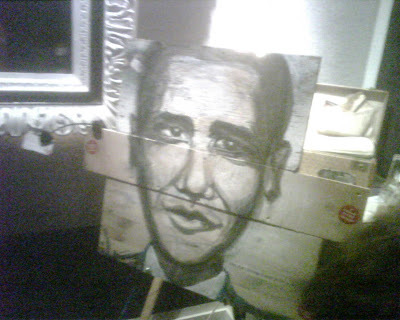 I was having drinks at a bar in the Mission, where this artist, seemingly pretty confident of the outcome, paid tribute to our Black President. 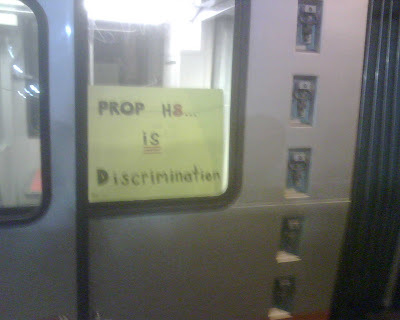 ...people took to the streets to protest the passing of Prop 8. See, bittersweet. I took this picture outside my front door, then walked up to the MUNI stop and got a glimpse of this very simple message that had been left behind. 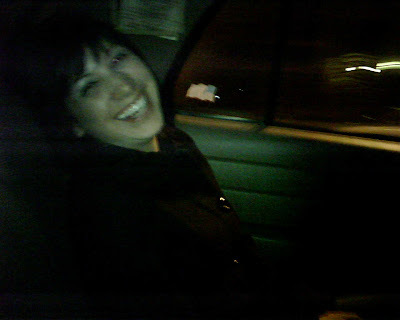 I took this shot in a cab one night, a week after I moved up here. Danielle always had a smile and a laugh that I found infectious, and even now I can't help but smile when I look at this picture. It reminds me of why I moved up here in the first place. It's true, things haven't worked out quite like any of us had hoped, but like I said, these memories, I wouldn't trade for anything in the world.